ROCKERS BY RICHARD creates high quality, solid wood Moses Basket/Bassinet Rocking & Stationary Stands of impeccable quality and craftsmanship. Each piece is individually hand created of only the highest quality materials with great attention to detail, and made of all natural organic wood. NO STAINS, NO PAINTS, JUST BEAUTIFUL WOOD AS FOUND IN NATURE - STURDY, SUPERIOR QUALITY- - ALL PROUDLY MADE IN THE USA - Team the stand with one our own Hannah Baby Moses baskets, also of the same high quality craftsmanship, great attention to detail, and with trend-setting designs and you will have A GREAT COMBINATION YOU WILL LOVE !! A beautiful Regal design with Elegant design features. Like no other moses basket stand ever. 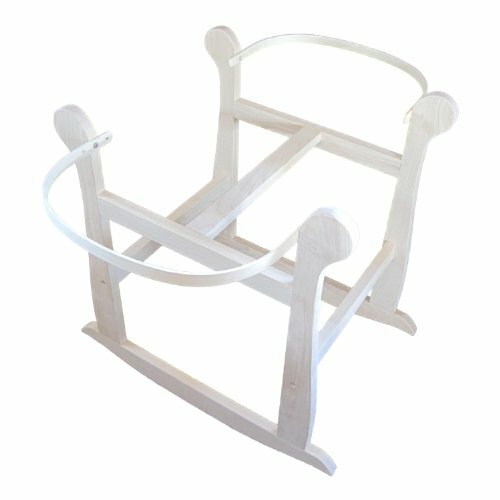 Our unique and elegant stand rocks like a cradle to gently rock your baby to sleep and comes with our wood end hoops, ours are the Original others have copied. Made of organic all natural solid wood and has no paints or stains, or toxic finishes. Many extra finishing touches you won't see on any other stand. Can be stained or painted to match your own décor.. Comes mostly assembled, with minimal very easy assembly required. WE EVEN INCLUDE THE TOOL! If you have any questions about this product by Rockers by Richard, contact us by completing and submitting the form below. If you are looking for a specif part number, please include it with your message.